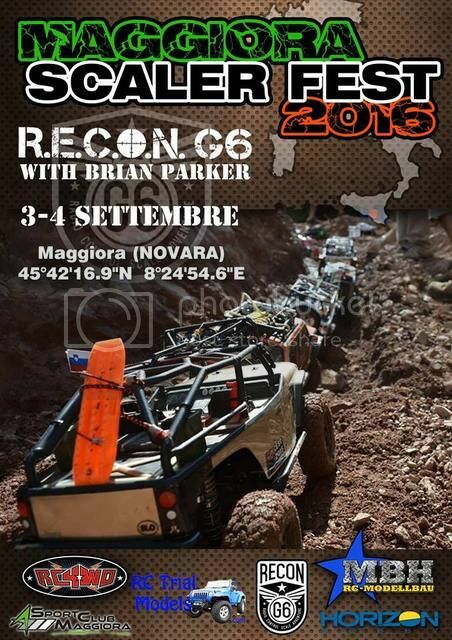 The Official Italian RECON G6, last event of the European Tour 2016, is back!!! 2 days of fun, 3/4 September at Sport Club Maggiora off-road arena during the Maggiora Scaler Fest! Brought to you by Sorrca Piemonte, in collaboration with Recon G6, Sport Club Maggiora and Trial Attack Racing Team. – A tow strap is mandatory and will be used during the stage. – 10 scale items are mandatory. A scale item can be a driver, bumpers, a pet, a spare tire, gauges, lights, bumper sticker, etc. – A scale book, titled “RECON G6 5 Years of Fun”. This item will earn you one raffle ticket in the “Look, I brought a scale book” bonus raffle. – A scale canoe, raft, surfboard, etc, for the bonus Float your boat Challenge. – Flag, license plate and typical scale items of your country. – 1.9 Adventurists – The class for 1.9 tire size vehicles. – 2.2 Adventurists – The class for 2.2 tire size vehicles. – Drivin’ Diva Class – Female Scale Adventure Drivers. – Family Fun Class – For Families that drive scale adventure together. – Veteran Class – 40 to 55 year old scale adventure drivers. This class will be sub-divided when 5 or more drivers of the same wheel size are present. – Senior Class – All drivers 56 and over. This class will be sub-divided when 5 or more drivers of the same wheel size are present. – GCM Tiny trucks class – For scale adventure rigs with 4.2" (107 mm) or smaller tires, full 3d interior, scale driver. – Truck Trials Class – For drivers of 6×6 scale adventure rigs. – Team Class – A class for 3 drivers. Each driver must drive their own scale rig. A Team starts together and must finish together. – 5 entries make a class. – The course is more than 4 km long. – Designated Driving and Driver Challenges will be encountered during the stage. – The stage may feature a variety of terrain and will be kept as close to scale as possible. – No Hog, self assigned penalties. Best of the show, most G6 ready and best Tiny truck (tires under 4.2” or 107mm, full 3d interior, scale realism) will be awarded. Special awards for the oldest, youngest drivers as well for the one who travelled the biggest distance to come to Maggiora for our event. On Sunday, 4th of September we will run a teams event. Each team is composed of 3 drivers (you choose the composition of your team) driving together on a timed stage with gates and stage boundaries. You can help your team buddies and use your winch without penalties; penalties will be assigned foe every gate/boundary touch and for penalty winch (self recovering using a towing rope with your hand). Each penalty is a time penalty, team members must finish the course together to stop the time, the lowest time wins. After the teams race there will be a sled pull contest, awards ceremony and sponsor giveaway. women and drivers under 15 years old are free.